The story of Henry Shacklock, who founded the firm at the beginning of the last century, is well known to us, but it is only recently that we have discovered the story of his nephew Philip Frank Shacklock. Philip Frank Shacklock was the son of George and Emily Shacklock of Alexandra Avenue, Mansfield; he was born on 5April 1896, educated at Queen Elizabeth Grammar School and Nottingham University, and was articled to his Uncle Henry in Sutton in Ashfield in January 1914. A copy of his Articles of Clerkship (known nowadays as a training contract!) signed by Henry Shacklock is held at the Nottinghamshire Law Society. In June 1915 Philip joined 2/8 Battalion, Notts and Derby Regiment (the Sherwood Foresters) as a Private. He served at Home, in Ireland in 1916, and later in France and Belgium, and was promoted to Sergeant. 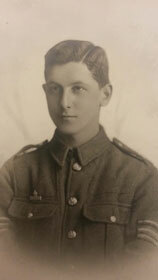 Philip died in France on October 10th 1917 of wounds received in action at Passchendale aged 21. His grave is at Etaples Cemetery in Northern France. Philip is remembered on War Memorials at Queen Elizabeth’s School in Mansfield, Nottingham University, and in St Peter’s Church across from our office in Mansfield. Philip’s name is also included in a memorial to those from the Nottinghamshire legal profession who were lost in the first world war. The memorial is to be re-dedicated at Nottingham Crown Court on 11th November 2014 in a ceremony organised by Nottinghamshire Law Society. If you have information to add to our story please contact Marion Vesey at Shacklocks on marionv@shacklocks.co.uk or on 01623 626141.